It was dark outside and the streets were empty when we left Los Angeles and drove north to Bishop. It's Labor Day weekend and we chose to celebrate our hard work with a challenging 55 mile hike in The Sierra. 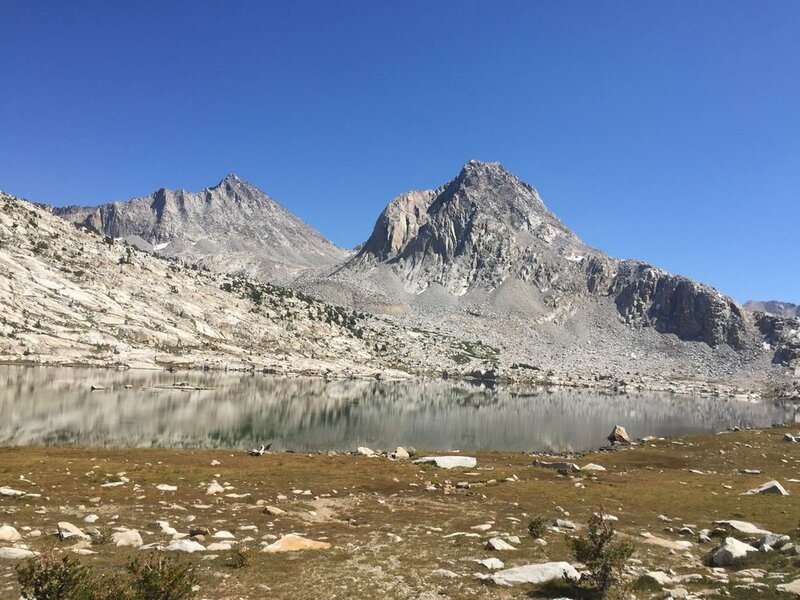 The North Lake to South Lake hike travels through the Evolution Valley and up and over Muir Pass along the Pacific Crest Trail/John Muir Trail. Three hours into the drive the sun began to rise over the Panamint Mountains and there was just enough light to reveal a silhouette of the peaks around us. 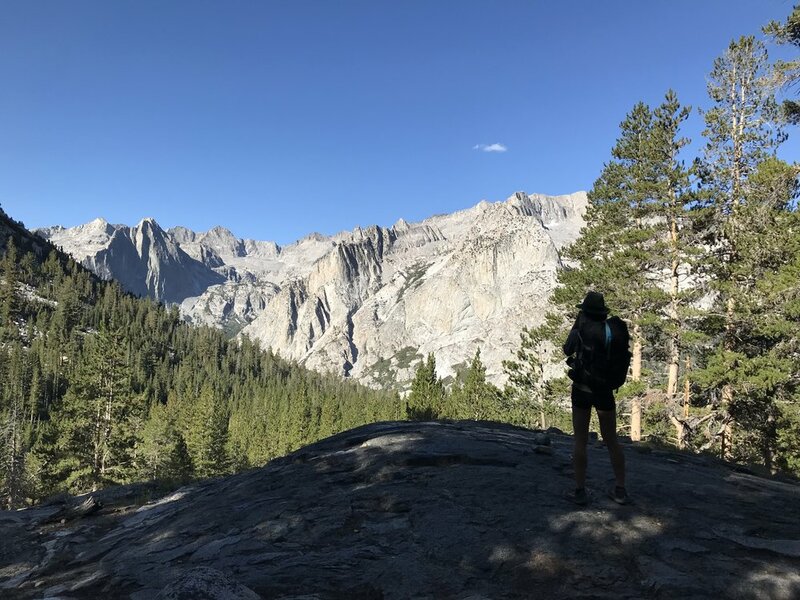 We parked the car at the Bishop Pass Trailhead and hopped on the Bishop Shuttle to North Lake near Piute Pass Trailhead and the beginning of our hike. 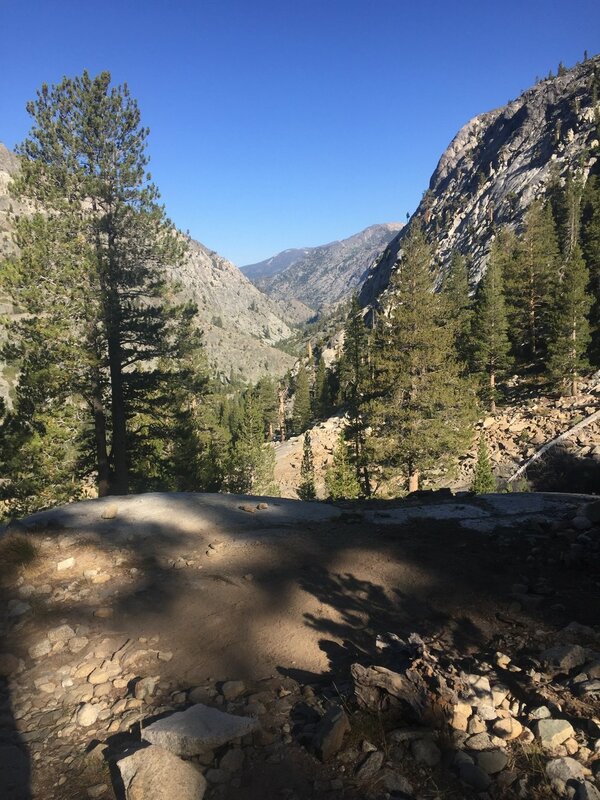 The trail to Piute Pass ascends for 2,000ft following the North Fork of Bishop Creek. Climbing up glacier carved granite rocks and passing by an abundance of alpine lakes - right away giving off the feeling that we had entered a different world. Just a few miles into our hike Cosmo and I stopped at Piute Lake to take a break and soak in the start of this short, but grand, adventure. Piute Pass Trail is a gateway to the backcountry of Kings Canyon and Sequoia National Parks. 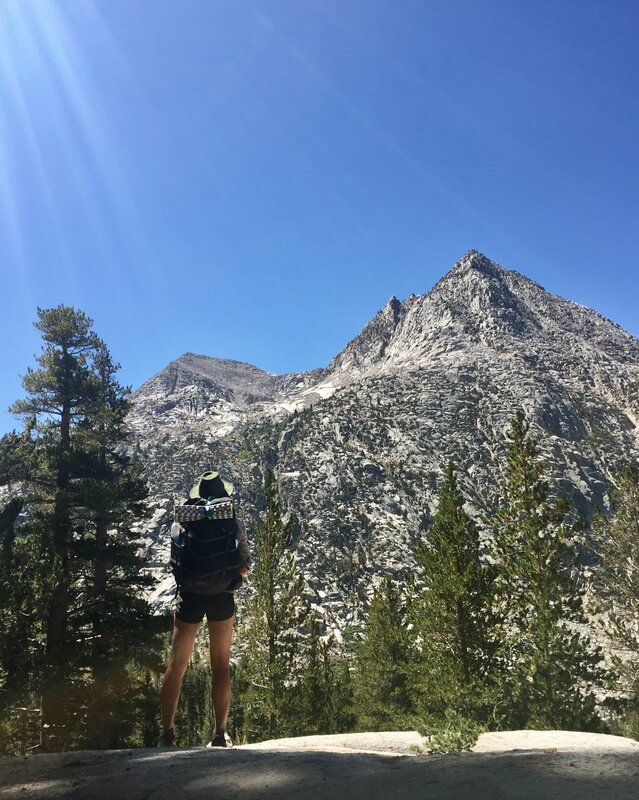 We hiked seven miles up and descended nine miles down where the trail connects to the PCT/JMT. At the juncture of the PCT we turn south onto and I smile as I remember walking northbound last year. It was July and yet the passes were still all covered in snow. I remember feeling relieved to have made it up and over the arduous seven miles of snow cups that covered the north and south sides of Muir Pass. I'm excited to be back here - excited to see what the Pass looks like now in September long after the snow has fully melted. We found a large campsite off of the San Joaquin River nestled amongst aromatic lodgepole pine trees. We sat by the river and ate our dinner as we watched the last bit of sun disappear behind the mountains. 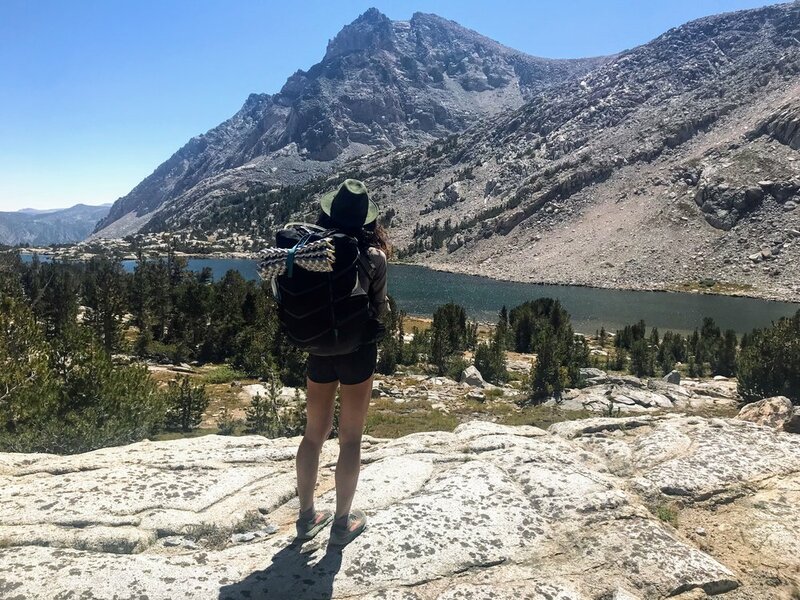 Amidst the jagged mountain peaks, high mountain lakes, and swiftly flowing rivers of Kings Canyon National Park I feel content. Without the distractions of city life, technology, or social media - I am able to pay attention. I let the sound of the rushing river and gentle creek of trees swaying in the wind soothe me to sleep. This morning we watched as the sun started to make its way down the mountainside, shining a spotlight on the giant granite rocks around us. We packed up camp and continued Southbound on the PCT. I hiked until I crossed into the morning light and could feel the warmth of the sun cover my body. It was here that I decided to take my first short break of the day, for I prefer to poop in the sunshine (at least 100 feet away from the trail and far away from water). We forded Evolution Creek without, unlike last year, carrying our packs over our heads through waist deep water. Cosmo and I planned to meet at Evolution Lake for lunch. On my way I stopped only for photogenic views and to pick delicious wild onions. The beauty of Evolution Lake is simply indescribable. Cosmo and I found an isolated lakeside beach where we swam and ate lunch. After a cold dip I sprawled out on a warm rock to sun bathe. It was then that I remembered that I placed the last of my beers in the water to cool. I grabbed the chilled aluminum can and cracked it open. The next few miles up to Muir Pass were stark in alpine beauty but most importantly, snowless. We took a short break in the hut and then continued down the trail. In 2017 this was a dangerous water crossing on the descent from Muir Pass! We descended until darkness, following the Kings River into the La Conte Canyon, and found a nice place to camp along the river in Little Pete Meadow. The temperature outside was comfortable and the summer mosquitos were gone, so we threw down a tarp and cowboy camped. We started the day with a steep set of switchbacks zig zagging up from the La Conte Canyon ranger station to the top of Bishop Pass. The trail flattened out a mile below the top, a perfect place for a break. Along the descent from Bishop Pass my blissful stroll was temporarily interrupted by an abrupt and sickening smell. I paused, looked up, and saw Cosmo stopped a few feet in front of me. Throughout my outdoor adventures I've hiked past various animal bones, camped next to a full deer skeleton, and have seen my fair share of eerily isolated animal skulls. I walked a few more steps and looked up at the hillside. My draw dropped when I noticed the remains of a herd of deer scattered throughout the rocks with two crows nonchalantly hopping around pecking at the remaining meat. A local hiker explained that this tragic accident was a byproduct of the extreme snow brought on in 2017. These deer were embarking on their normal migration over the pass when they slipped in the heavy snow and ice and all fell tragically down the mountainside. It was tough to get the gruesome image out of my head as we continued on down the trail. I knew that 2017 was a dangerous time to be in the sierra, but its always a striking reminder to be in the face of the consequences of that danger. WARNING: photos below contain graphic and disturbing images. We continued to descend into the scenic Dusy Basin gazing out at the talus and jagged peaks of the Palisades (a subrange of the Sierra Nevada). We continued down the trail passing by sparkling alpine lakes and colorful meadows. Eventually we reach South Lake and the Bishop Pass Trailhead, the end of our trek. We had a short road walk to the car, As we drove the winding road back to Highway 395 I thought about how nice it would be to live closer to the mountains, closer to the places where I feel most happy and most myself.